The Supreme Court today stayed the death sentence of a convict in the murder of New Zealand woman mountaineer Diana Clare Roultley, who had gone missing from Varanasi eight years ago and whose skeletal remains were later recovered by the police from the convict’s house from a village in Ghazipur district where he had allegedly buried the body. From Kolkata to Kunming via Bangladesh! Winds of change are sweeping India and its immediate neighbourhood. Sample the following. Cities in India will have to manage their water resources if rural India is to survive and the solution lies in both traditional wisdom and modern technology. 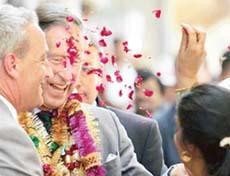 Prince Charles (second from left) is welcomed by a resident with rose petals during a visit to the walled city of Jaipur on Friday. A CPM Politburo member, Mr Biman Bose, who is also the Left Front chairman, was today declared the successor to the late Anil Biswas, who died on March 26, as the party’s state secretary. Who will contest against Sonia Gandhi at Rae Bareli is a million dollar question. But today it became clear that so far as the Bahujan Samaj Party is concerned, it is not interested in pitching a candidate against her. In a move which has led to considerable speculation in party circles, Congress President Sonia Gandhi turned to her old loyalists when she recently found herself in the eye of a political storm triggered by the office of profit controversy. President A.P.J. Abdul Kalam today conferred 22 Shaurya Chakras for displaying gallantry on Armed Forces and para-military personnel at a ceremony in Rashtrapati Bhawan here. The CBI has arrested three more persons, including the Head of the Department (Commerce) of Madras Presidency Collage, Chennai, Prof Kattimuthu, in connection with the 2006 All-India Postgraduate Medical Entrance Examination paper leak case. Singer Lata Mangeshkar is locked in a fresh controversy with a newspaper here accusing her of 'economising on fact'. The Union Cabinet yesterday approved an overall expenditure of Rs 242.95 crore for providing relief items to the quake-affected people in Jammu and Kashmir. Madhya Pradesh Minister of State for Home Nagendra Singh yesterday took command of the operation to track down the Gadaria gang of dacoits said to be responsible for abduction of eight persons in Shivpuri district two days ago. Prime Minister Manmohan Singh today expressed confidence that political parties would arrive at a consensus on the proposed legislation on the office-of-profit issue ahead of the Parliament session being convened from May 10. Overlooking the protests being made by the its employees, the Airports Authority of India is going ahead with the privatisation of Delhi and Mumbai airports and would sign the operation, management and development agreement with its private joint venture partners next week. The Union Cabinet yesterday approved the government’s contribution of Rs 48.33 crore for the Khalsa heritage project to Punjab government and release of balance amount of Rs 46.33 crore. An amount of Rs 2 crore has been released to the state government during 2004-05. Two of the prominent leaders of the All-India Anna Dravida Munnetra Kazhagam electoral front have decided not to contest the May 8 Assembly elections in Tamil Nadu. Seer brokers peace between Uma, BJP. World's highest medical research center at Leh. Man creates devices with scrap. Admitting the appeal of the convict, Dharam Dev Yadav, against the Allahabad High Court order, upholding the award of capital punishment to him by the Sessions Court, a Bench of Mr Justice B.N. Agrawal and Mr Justice A.K. Mathur stayed the execution of the convict till his case was decided. The FIR in the case was registered following a complaint by Diana’s father on July 28, 1998, a year after he had travelled to Varanasi on receiving the report about the missing of his daughter from a local guesthouse on August 10, 1997. As per the prosecution, she was last seen with Yadav, a rickshaw-puller by profession, who had acted as a tourist guide for her. Diana had visited Varanasi before she planned to go to Darjeeling to join a mountain expedition. Though there was no eyewitness in the case, the Sessions Court had convicted Yadav on the basis of circumstantial evidence as the DNA test of the skeletal remains had matched those of the victim’s father, as per the report of Hyderabad-based DNA Engineering Laboratory. But the post-mortem examination of the skeletal remains done by local doctors could not establish the actual time and real cause of the death, while the police claimed to having recovered certain articles of Diana from Yadav and four of his friends, who were also made accused. The Sessions Court had acquitted the other four giving them the benefit of the doubt. Convict’s counsel Sunil Kumar Singh challenged the High Court and trial court orders on the ground that the “capability” of the expert who had given the DNA report has been “questioned” by the different courts throughout the country and could not be relied upon and there was no other direct evidence in the case. How about a car rally from Kolkata to Kunming (China) via Bangladesh? Kunming, a popular tourist resort in southwestern China with a history of 2,400 years, served as gateway to Silk Road that facilitated trade among Tibet, Sichuan, Myanmar and India. Or how about transportation of cargo from Kunming to Kolkata through Myanmar and Bangladesh? Besides, the four countries are likely to work for enhancement of civil aviation links, development of tourism circuits and promotion of cultural exchange among themselves. A new Track-II initiative, called the Forum on Regional Economic Cooperation among Bangladesh-China-India-Myanmar or BCIM, has suggested such measures for bringing about a greater subregional cooperation among these countries. Indications are that these suggestions are falling on receptive ears of the governments concerned. The BCIM forum has come up with ideas for subregional cooperation in some important areas such as trade, transport, tourism and energy security. The BCIM initiative has attracted much attention in India as it has the potential to bring India’s three important neighbours closer in a joint pursuit of common prosperity through the increasing use of mechanisms of regional integration. This was stated by Mr Rajiv Sikri, Secretary (East) in the Ministry of External Affairs, while addressing the sixth meeting of the BCIM forum here. He also said that the Indian state of West Bengal, Bangladesh and the northeast region of India have historically constituted an integrated space. India shares a long land and maritime boundary with Myanmar — a country which is India’s gateway to South East and East Asia. India is involved in a number of infrastructure projects in Myanmar to improve road and rail connectivity and address its energy needs. Mr Sikri said India-China relations had now acquired “a long-term, global and strategic character”. The BCIM initiative augurs well when concepts like a Pan-Asian Free Trade Area or Asian Economic Community are being seriously considered to take optimal advantage of the continent’s new economic dynamics. The four countries are already interacting with one another through bodies promoting regional and subregional cooperation. “India and Bangladesh are close partners in SAARC where China will also be an observer. Bangladesh and Myanmar closely cooperate with us within the framework of the Bay of Bengal Initiative for Multi-Sectoral Technical and Economic Cooperation, or BIMSTEC,” he added. With Myanmar, India shares another important regional organisation, the Mekong-Ganga Cooperation (MGC), besides cooperating within the India-ASEAN Summit framework. Both India and China are summit partners of ASEAN. With China and Myanmar, India has joined hands in a new initiative in the form of the East-Asia Summit, launched in December last year in Kuala Lumpur. These three countries are also cooperating within the framework of the Pentalateral Group on Drug Control. This was the broad consensus that emerged at a two-day conference here on “Towards a sustainable water future: strategies to address competing claims”, attended, among others, by Prince Charles and leading environmentalist Sunita Narain. The conference, which concluded yesterday, also came out with a series of recommendations for countries like India, grappling with scarce water resources: Use water prudently, conserve every drop and recycle wastewater from cities and industry, along with a comprehensive water policy that addresses these issues while ensuring linkages with related sectors like energy, forestry and agriculture. The conference was co-organised by the Jai Bhagirathi Foundation and the UNDP in partnership with the Italian Government, UNICEF and the Swedish Development Assistance. Prince Charles, who inaugurated the conference, warned that increasing and unsustainable demands on water would make the water table fall rapidly, and “if we care about the future of our children and grandchildren, we need to work in harmony with nature and give back what we take”. The decision of Mr Bose’s appointment as the party secretary was announced at a press conference by the Chief Minister, Mr Buddhadeb Bhattacharjee, after a meeting of the state committee. Earlier, at a secretariat meeting held this morning at the Alimuddin Street party office in the presence of party general secretary Prakash Karat, Mr Bose’s name was proposed by Mr Jyoti Basu and seconded by Mr Bhattacharjee, who later said the decision was unanimous, both at the secretariat and the state committee meetings. Mr Bose, who was born on July 1, 1940, became a member of the Communist party in 1954 and in 1970 was elected general secretary of the Students Federation. In 1984, he became a member of the party state committee, in 1978 a secretariat member and subsequently in 1985 a central committee member. In 1998, he was inducted into the Politburo along with Mr Bhattacharjee and the late Biswas. The same year, he took over as the chairman of the Bengal’s Left Front committee after Sailen Dasgupta’s death. Mr Bose will hold the offices of both the party secretary and the front chairman. Though Mr Bose was present at the press conference, he refused to make any statement. Later, at Anil Biswas’s condolence meeting at the Netaji indoor stadium, Mr Bose, who was introduced to the gathering as Biswas’s successor by Mr Karat and Mr Jyoti Basu, said they would work collectively and fulfil their past commitments. Addressing party cadres, BSP supremo Mayawati declared that her party would not field a candidate against Ms Gandhi in the forthcoming byelection in Rae Bareli as she believed that it was crucial for Ms Gandhi to remain in Parliament. Addressing at Ambedkar Maidan, Mayawati, without completely agreeing with the way Ms Gandhi was being portrayed as a martyr who had sacrificed for the nation, said her party believed that for a healthy public life it was crucial for Ms Gandhi to continue being a Member of Parliament. However, Uma Bharti avowed to free the people of Rae Bareli from the “clutches of the Nehru-Gandhi family” whom she charged with emotionally exploiting the people of Rae Bareli. Speaking to the mediapersons, Uma Bharti promised to field a woman candidate against Ms Gandhi. She, however, refrained from naming the candidate. She said the woman candidate would be named after discussion with all parties on or after April 30. Criticising Ms Gandhi for her reported opportunistic politics, Ms Bharti said devoted and honest politicians were not the “monopoly of Italy alone”. According to her, they were found in every nook and cranny of the country. Meanwhile, responding to Samajwadi Party national general secretary and Rajya Sabha MP Amar Singh’s public statement during a rally in Tinsukia, AICCI member and Congress MLC Siraj Mehndi suggested him to either fight elections against Ms Gandhi from Rae Bareli or stop criticising her in future. Speaking at a party rally at Tinsukia, Mr Singh had advised Ms Gandhi not to return to the Lok Sabha if she wanted to uphold high moral values. She especially reached out to senior leaders like Human Resource Development Minister Arjun Singh, Mohsina Kidwai, M.L.Fotedar and Uttaranchal Chief Minister N.D.Tiwari, who have been sidelined during the past several months but could now well be back in favour. Although Mrs Gandhi did not find it necessary to consult any senior party leader (she has publicly admitted that she only took her children into confidence on this issue) when she decided to resign from the Lok Sabha and the chairmanship of the National Advisory Council, she called up only three party colleagues to inform them about her decision. While nobody is surprised that she rang up Prime Minister Manmohan Singh to tell him that her resignation letter was on the way, Arjun Singh and M.L. Fotedar were the other two persons she called to inform them about her decision, a move which has set the party grapevine abuzz. Other senior leaders like Defence Minister Pranab Mukherjee and Home Minister Shivraj Patil learnt of her decision from the Prime Minister as they were all in a meeting when Mrs Gandhi called up Dr Singh. In fact, Mrs Gandhi had a 45-minute one-to-one meeting with Mr Arjun Singh at her 10 Janpath residence, shortly before she went public with her decision. Since he had a long discussion with Mrs Gandhi, Mr Arjun Singh did not think it necessary to join his other senior party colleagues who lined up at Mrs Gandhi’s residence the next day to offer their resignations to her. Mr N.D.Tiwari was among the two Chief Ministers who met her, the other being Maharashtra Chief Minister Vilasrao Deshmukh. Similarly, old timer Mohsina Kidwai was the only party leader who was allowed to accompany Mrs Gandhi when she addressed a public rally in her Lok Sabha constituency Rae Barelli on her first visit there after her resignation. While Mrs.Kidwai was seated with the Congress President on the stage, other party leaders — UPCC chief Salman Khursheed and Ashok Gehlot, AICC General Secretary in charge of UP — travelled with her only up to the border of her constituency. Although seemingly minor, these developments have triggered considerable speculation in the Congress about a possible “realignment of forces” within the party. All the leaders, particularly Arjun Singh and M.L.Fotedar, who were contacted were once well-known as the family loyalists and considered Mrs Gandhi’s key political advisers. They had been marginalised over the past several months and were not being consulted on key political issues. The band of Mrs Gandhi’s political advisers and strategists has been shrinking and there is an overwhelming feeling in the party that she is not getting adequate political inputs. The recent developments could well change the situation, it is felt. The President also conferred 17 Param Vishisht Seva Medals, two Bars to Ati Vishisht Seva Medal and 25 Ati Vishisht Seva Medals on senior officers of the Armed Forces for distinguished service of exceptional order. Prime Minister Manmohan Singh, Defence Minister Pranab Mukherjee and Home Minister Shivraj Patil were among those present on the occasion. Shaurya Chakra: Wing Cdr Alagaraja Perumal, Hawildar Rathwa Gordhan Bhai Kalji Bhai (4559439) (Posthumous), Naik Ishwar Singh (3185156), Hawildar Chandra Bahadur Gurung (14907560) (Posthumous), Operator Excavating Machinery Rameshan J. (GS-175480L) (Posthumous), Lieut-Col Gaurav Rishi (IC-50850), Maj Thongam Joten Singh (IC-58637), Maj Nectar Sanjenbam (IC-61357), Sqn Ldr Sushil Vijay Sansare (23770), Sqn Ldr Pulluvallyil Raman Sudhakar Panickar (23634), Asstt Executive Engineer Tapan Kumar Sahoo (GO-2757F), Superintendent (Bldgs & Roads) Grade II Sanjai Kumar (GS-176653K) (Posthumous), Overseer Sukumar Sharma (GS-167226M) (Posthumous), Driver Motor Transport III Christapher F. (GS-163891X) (Posthumous), Operator Excavating Machinery Laxman Singh (GS-165523 F) (Posthumous), Maj Neelesh Anand Pagulwar (IC-53657), Maj Salman Ahmad Khan (IC-58686) (Posthumous), Operator Excavating Machinery Grade II Vikram Singh (GS-159664 A), Operator Excavating Machinery Grade II Bodh Raj (GS-166037 W), Hawildar Surve Madhusoodan Narayan (2789249), Paratrooper Thanmi Muinao (4371321), Subedar Sukhwinder Singh (JC-429076). Param Vishisht Seva Medal: Lieut-Gen Arvind Sharma (IC-16900), Vice-Admiral Arun Kumar Singh (OO876-R), Air Marshal Avinash Deodatta Joshi (10886), Air Marshal Avdesh Kumar Singh (11005), Lieut-Gen Bhopinder Singh (IC-16289), Lieut-General Vijay Kumar Chopra (IC-16338), Lieut-Gen Ravinder Nath Kapur (IC-17291), Lieut-Gen Gurditar Singh (IC-17327), Lieut-Gen Kamal Krishna Khanna (IC-17640), Lieut-Gen Arun Kumar Chopra (IC-17674), Lieut-General Manikath Govindan Girish (IC-17214), Lieut-General Trevor Aloysius D’cunha (IC-16309), Lieut-Gen Charanjit Singh (IC-17279), Lieut-Gen Ramji Rai (retd) (MR-O2064), Vice-Admiral Datla Sai Prasad Varma (50199-N), Vice-Admiral Vijay Swarup Mathur (60147-Y), Air Marshal (Mrs) Padma Bandopadhyay (11528) (retd). Bar to Ati Vishisht Seva Medal: Lieut-Gen Aditya Singh (IC-17565), Lieut-Gen Kulwant Singh Dogra (IC-28805). The CBI has arrested three more persons, including the Head of the Department (Commerce) of Madras Presidency Collage, Chennai, Prof Kattimuthu, in connection with the 2006 All-India Postgraduate Medical Entrance Examination paper leak case. The other two are Raghu, a clerk at Asan Memorial School, Chennai, and Manoharan, Senior Assistant at Pachyapas College, Chennai, a CBI spokesperson said here today. With this, the total number of persons arrested in the paper leak case has risen to seven. Till now, Rs 18 lakh have been recovered during raids conducted in Tamil Nadu, Uttar Pradesh and Delhi. Yesterday, the CBI had arrested four persons — Ravi Kanan and N. Bhaskar (Senior Residents of the prestigious Jawaharlal Institute of Postgraduate Medical Education and Research (JIPMER), Pondicherry, Vijay Kanan, a second-year student of MD (Anaesthesia) in the same institute, and P. Satish Kumar, a second-year student of MD (Paediatrics) at Madurai Medical College. The veteran singer of Bollywood had allegedly told 'Mumbai Mirror', published by the Times of India group, that she would leave Mumbai if the Maharashtra Government goes ahead with constructing a flyover outside her flat in Tony Pedder road. Residents on the upper floors of the buildings here have been opposing the flyover on the grounds that it will enable motorists to peek inside their houses. Lata Mangeshkar and her sister, Asha Bhosale, who live here had first come out in protest against the flyover when it was first mooted in 2001. The state government had then backed down and decided against the construction. However with increasing traffic, the proposal to construct the 3.5 km-long flyover has been revived since it will help faster movement of traffic to downtown Mumbai. After details of the fresh proposal appeared in the media earlier this month, Lata Mangeshkar told the newspaper that she would leave Mumbai rather than risk her voice to noise pollution. 'Ab to Mumbai chodna hi padega,' has been the quote attributed to her. However, Lata Mangeshkar's fresh opposition raised people's hackles with one newspaper even offering to help her pack! Subsequently, Lata Mangeshkar denied giving any interview opposing the flyover. Today, the newspaper hit back by publishing transcripts of the tape recorded interview and even sent her a copy of the tape to 'jog her memory'. The amount, to be incurred by various ministries, would cover procurement of tents, construction material for erection of temporary and intermediate shelters and other such activities, Parliamentary Affairs Minister Priyaranjan Dasmunsi told reporters after a Cabinet meeting. He said the Cabinet also approved the expenditure incurred by paramilitary forces on providing relief items to the victims of the devastating earthquake in October, last year. Jammu and Kashmir was the worst affected state in the earthquake, which caused devastation in 2,760 villages in 12 districts. Of these villages, 149 were severely hit and 2,611 partially affected. The provision of relief items includes the procurement of blankets and woollen garments and supply of school uniforms, sports goods/indoor games, mattresses and supply of drinking water bottles. The provision of shelter material and cost of construction of shelters covers items such as procurement of tents/imported tents; procurement and supply of CGI sheets; construction cost of temporary shelters; procurement of material for construction of community halls; dismantling, loading/unloading and insurance charges for the transportation of pre-fabricated structures. The gang members had stopped a bus going from Shivpuri to Sheopur near Karahal mountain slope, asked the passengers to get down and set the bus afire. The gang then selected eight persons belonging to the trading community and took them away into the Chambal ravines. Shivpuri and Sheopur districts observed complete bandh yesterday and today in protest against the kindapping. The police had been scouring the Chambal valley by a helicopter but had not been able to locate the kidnappers or the kidnapped. Mr Nagendra Singh, along with Principal Secretary (Home) Satya Prakash, and Additional Director General of Police (Intelligence) S.K. Raut, has reached the area to supervise himself the operation. Rambabu Gadaria, the leader of the gang, is said to be enjoying the patronage of police officers and politicians of the area with the result that no sincere effort has ever been made to nab him in spite of dozens of cases of murder, kidnapping and ransom against him. He said Defence Minister Pranab Mukherjee, who had been entrusted with the task of consulting parties, was writing to them seeking their views on the issue. “Parliament is meeting on May 10. I hope this process will be completed before time”, he said on the sidelines of a defence investiture ceremony at Rashtrapati Bhavan here. The Cabinet Committee on Parliament Affairs had yesterday decided to reconvene the session from May 10 after the Assembly elections. Overlooking the protests being made by the its employees, the Airports Authority of India (AAI) is going ahead with the privatisation of Delhi and Mumbai airports and would sign the operation, management and development agreement (OMDA) with its private joint venture partners next week. The OMDA would be signed on April 4 between AAI and the GMR and GVK groups, which have won the bids for modernisation of the Delhi and Mumbai airports respectively, official sources said. The OMDA is the mother document, under which AAI grants the right to undertake functions, including operations, maintenance, development, design, construction and management to the joint venture companies. It is for an initial term of 30 years, extendable by as many years. As per the plan the AAI would form subsidiaries with some banks and financial institutions, mostly from the public sector, which would set up two JV companies with GMR and GVK to modernise the two airports. While nine dierctors from the GMR will be on the board along with three from AAI on the JV for Delhi airport modernisation, there would be nine from GMR and three from AAI on the JV for the Mumbai airport modernisation project. The complex will provide a fascinating insight into the Sikh faith and showcase its history of the past 500 years. The project will be fully commissioned by 2007, said Information and Broadcasting Minister Priya Ranjan Dasmunsi. Two of the prominent leaders of the All-India Anna Dravida Munnetra Kazhagam (AIADMK) electoral front have decided not to contest the May 8 Assembly elections in Tamil Nadu.